By tradition, Dave and I keep New Year’s Eve pretty low key. We usually stay home. We watch a feel-good movie and eat paleo nibbles and enjoy the quiet and the promise of the new year. Whether you’re enjoying a quiet evening in or hosting a celebratory bash, you need snacks! These recipes that will ensure you wake up feeling great on New Year’s Day. 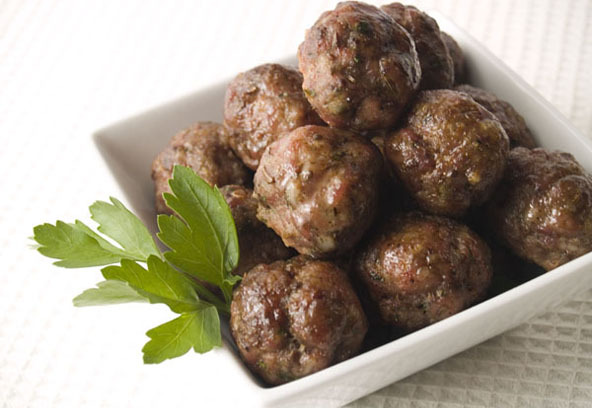 Every meatball recipe instantly becomes party food if you make the meatballs tiny – say, 1/2-inch in diameter – instead of normal sized. To preserve the spherical shape, and thus the fun, bake them instead of frying. Just make your favorite meatball recipe, roll them small, then place in a single layer on a baking sheet and throw ’em in a 375-degree oven for 20-25 minutes. Line the baking sheet with parchment or foil and save yourself clean-up time! Bonus points if you spear each meatball with a frilly toothpick. Or any of the 15 meatball varieties in Well Fed 2! A circle topped with something creamy screams ‘APPETIZER.’ Whip up a batch of homemade mayo, and go dollop crazy. HB Eggs: An unassuming hard-boiled egg becomes magical when sliced and topped with a touch of mayo and a sprinkle of fresh chopped chives or truffle salt. Scotch Eggs: Slice Scotch Eggs into rounds, then top with either mayo or a tiny dollop of mustard (or both!). Cucumber Bites: Slice cucumbers into rounds, top with a little touch of mayo, then sprinkle with a tiny amount of chopped black olives and chives. Here’s a trick to improvise a pastry bag so you can pipe the mayo onto your hors d’oeuvre: place mayo in a small plastic baggie, snip off a corner of the bag, then slowly twist the bag to squeeze the mayo out the corner in a thin stream. Pretty little dollops, no fuss! Meat on a stick is an instant party! Follow the instructions for The Best Chicken You Will Ever Eat. Ever. but instead of grilling the chicken breasts whole, cut them into 1-inch cubes and grill on bamboo skewers. (Be sure to soak the skewers in water for 5 minutes before threading the meat onto them.) 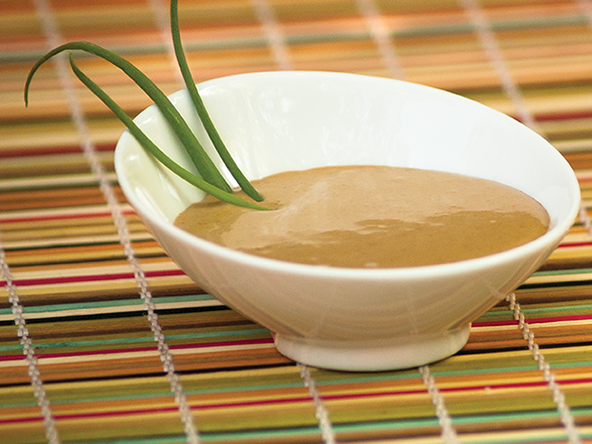 Serve with Moroccan Dipping Sauce or one of the other sauces below. No forks = 100% fun. 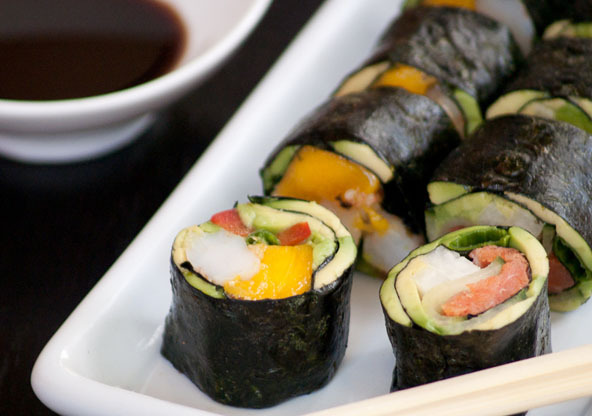 This Riceless, No-Soy Sushi is elegant and adds international flair to your spread. Set out tiny bowls of coconut aminos or homemade substitute and wasabi for maximum yum factor. No self-respecting host/ess would neglect the two party standbys: nuts and olives. But don’t you deserve to make ’em fancy? Of course you do! I recommend: Marinated Olives and Spiced Nuts. (Note: The spiced nuts include a little coconut sugar. I am OK with that if you’re not in the midst of a strict Whole30. If you are eating 100% clean, skip the sugar in the recipe. If you’re a generally clean eater not in a no-cheat phase, the sugar is a very minimal amount.) You might also consider Caramelized Coconut Chips and Smoky Pear Bites — both are super fast and easy to make, and nummy to nosh. 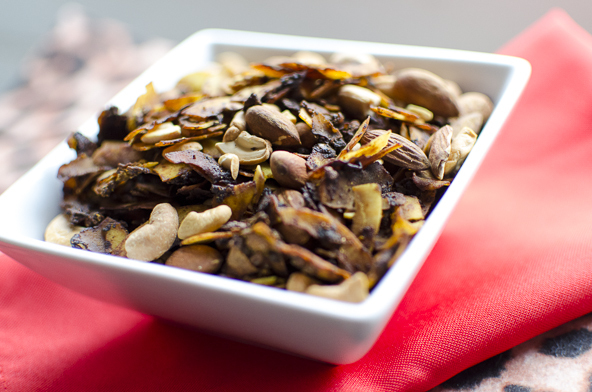 Or how about some Savory Paleo Granola to take the place of Chex Mix! When I was a kid, we always had a giant bowl of Ruffles on our holiday buffet table. 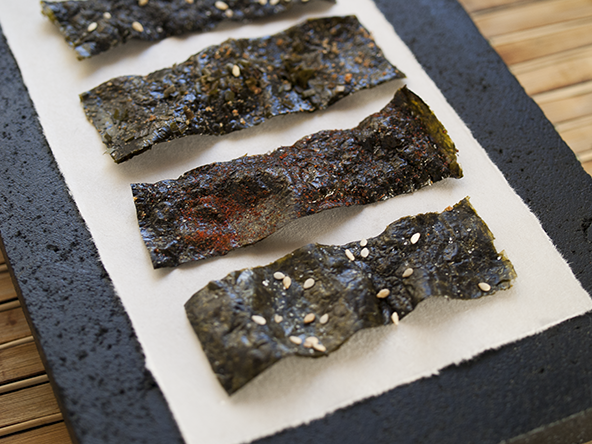 These days, I turn to nori chips. They’re salty, crispy, and a superfood. Raw vegetables? Boring. Crudité? French and fantastic! With creative chopping and a little imagination (check out some of these fancy platters), you can elevate vegetables to new heights of glory. Include raw, grilled, and blanched veggies in your platter to vary the textures – and garnish with fresh sprigs of parsley, olives, artichoke hearts, or hearts of palm… all of which are delicious dipped in sauces like Tahini Dressing, Sunshine Sauce, Moroccan Dipping Sauce, Baba Ghanoush, Chimichurri, Creamy Italian Dressing, Ranch, or Cumin-Lime Dressing. Need ideas for the platter? Here are some other nibbles that require no recipe and very little time – you just need some frilly toothpicks and, perhaps, the ability to cut stuff into cubes. Cucumber Kebabs: Cut a cucumber into 1/2-inch cubes and a handful of olives in half. Thread half an olive on a toothpick, add a cucumber cube, then top with the other olive half. Antipasto Platter: Arrange canned sardines and/or kipper snacks on a platter in a pleasing design, then garnish with red pepper strips, cucumber rounds, and artichoke hearts. Squeeze a half lemon over the whole thing and sprinkle with chopped parsley. Tomato & Olive Salad: Cut grape tomatoes in half and place in a bowl. Mix with a little olive oil, a clove of crushed garlic, chopped fresh basil, salt, and pepper. Arrange on a platter with black olives and use toothpicks to spear and eat them. Remember: no forks! Tiny Tuna Boats: Make You’re The Top Tuna Salad or Mediterranean Tuna Salad. Cut a green or red pepper into 2-inch wide wedges. Pile a tablespoon or two of the tuna salad onto the end of the pepper wedges (so one end is a handle and one end is like a scoop) and sprinkle with chopped parsley. I hope this has inspired you to ring in the new year with your favorite people and your favorite good-for-you foods. For maximum joy, be sure to listen to some appropriate music and dance while preparing your snacks! Thanks!!! We’re attending a party and I need to make sure there is something there I can eat. You’ve given a ton of great ideas here! Melissa – I have your 3 cookbooks, and got Weeknights for Christmas from my husband. I love it – it has helped get me out of a cooking rut. I eat a modified AIP, and there are a lot of days where it is just hard to eat that way and I end up making some basic survival meat/veg for myself and something else for my family. So far, I’ve made the Gyro dish in the Meat & Potatoes section – everyone loved it, and last night I made the chicken paillards with two toppings – big hit! So, thank you!! I have just started to be able to add a few foods back on my list of tolerable things to eat and I couldn’t be happier to make your dishes that burst with flavor and give me joy in eating again!! All the best for a great 2017! This made my day! Thank you for taking the time to stop by and let me know you’re enjoying the new recipes. I’m SO happy you’re not feeling deprived. That’s to fun! Have an awesome 2017.